This book synthesizes a decade of research by the author into fundamental issues in organization design. 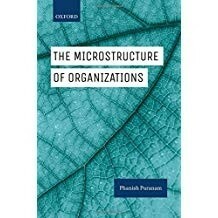 The result is a novel micro-structural perspective on organizations, which aims to both expand and narrow current thinking. The new perspective takes an expansive view on the kinds of phenomena that can be studied in terms of organization design- such as cross-functional teams, strategic partnerships, buyer-supplier relations, alliance networks, mega-projects, post-merger integration, business groups, open source communities, and crowdsourcing, besides traditional concerns with bureaucratic organizations. At the same time, this approach narrows focus by abstracting away from the variety and complexity of organizations to a few fundamental and universal problems of organizing (that relate to how they aggregate their members' efforts), as well as a few reusable building blocks microstructures (which capture common patterns of interaction between members of an organization). The microstructural approach to organizations will be of interest to researchers and PhD students in management, organization science, and strategy.